Zane Caplansky, a Toronto caterer, has recently opened up a Jewish delicatessen, serving hand-carved smoked meat sandwiches with homemade whole-grain mustard. The launch of the new Deli was promoted with a set of three print advertisements highlighting the Jewish nature of the company, using a combination of Yiddish and Christian phrases to connect with the local clientele. “Leper Schleper. 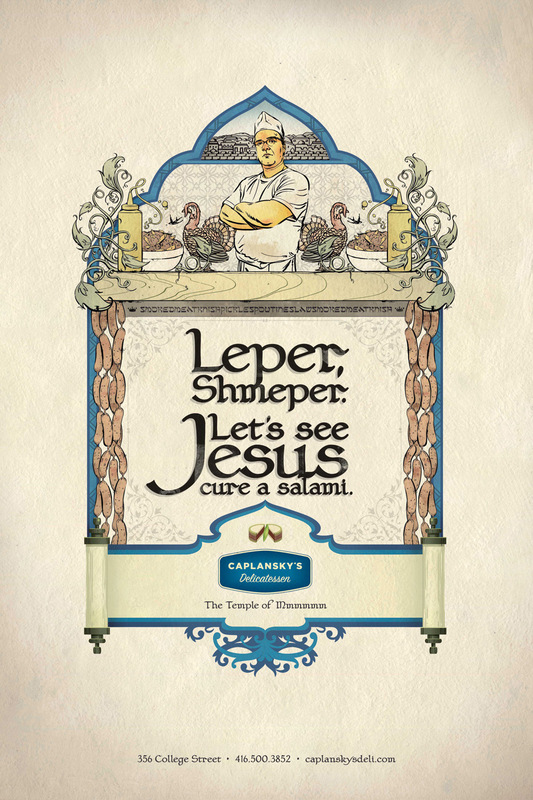 Let’s see Jesus cure a salami! Caplansky’s Delicatessen. The Temple Of Mmmmmm.” A reference to Jesus curing Jewish lepers in the Christian Gospels. “Temple” is the name given to the synagogue by most Reform Jewish congregations. “We Make A Mean Sandwich. Old Testament Mean. Caplansky’s Delicatessen. The Temple Of Mmmmmm.” “Old Testament” is a Christian phrase to describe the Hebrew scriptures. 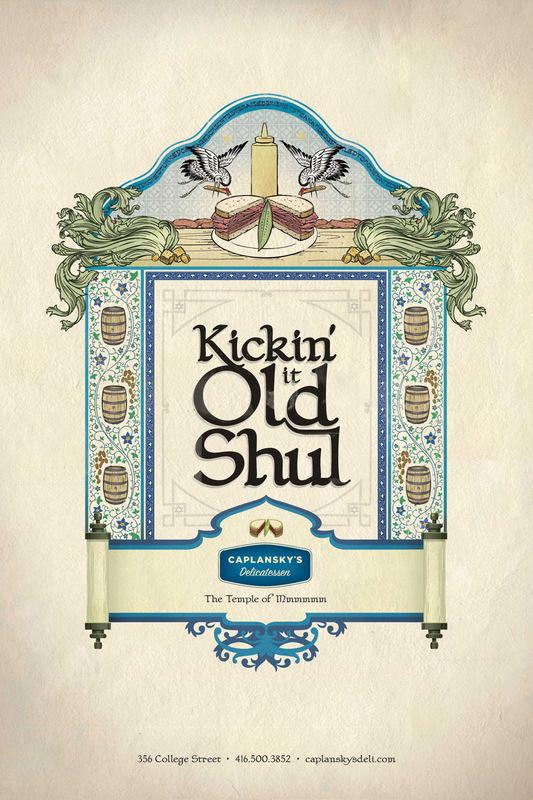 “Kickin’ It Old Shul. Caplansky’s Delicatessen. The Temple Of Mmmmmm.” “Shul” is the Yiddish name used for both school and synagogue, derived from the German word for school. 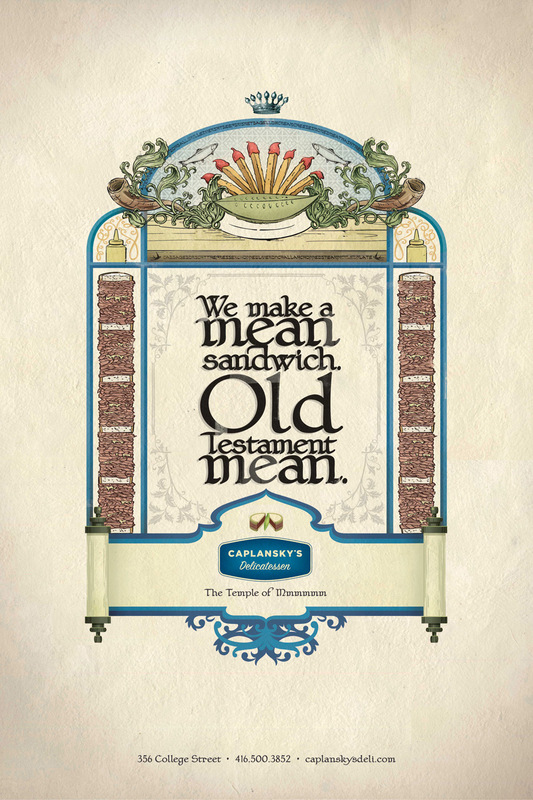 The Caplansky’s campaign was developed at Bensimon Byrne, Toronto, by creative director David Rosenberg, art director Glen D’souza, copywriter Michael Takasaki and illustrator Geoff Donovan.